When you visit City Forest, you must remember that you are a guest in the home of the animals that live there. Also, you are sharing an experience with dozens of other outdoor enthusiasts, some of whom go to the forest for a peaceful walk or to watch wildlife. By observing the following etiquette tips, you can help everyone enjoy their stay. 1. Dogs should be on a leash at all times, not only for their safety but out of respect for others’ wishes. 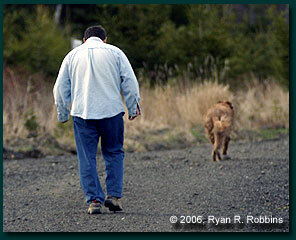 Your dog’s instincts to chase or track may send it off the trail and deep into the woods, leaving you far behind. Worse, your dog may have an unfortunate encounter with a skunk or porcupine. Also, remember that not everyone sharing the trail with you and your dog is comfortable with a strange dog running up to them. This is especially true with families including young children. Unlike this man, keep your dog on a leash at all times. It's courteous to others, and you won't have to worry about your dog running away or having an unfortunate encounter with a porcupine or skunk. 2. Don’t shout to others in your hiking or biking party. Some people on the trails are looking for solitude or even wild animals to watch or photograph. 3. If you want to listen to music or the radio, wear headphones. Some people on the trails are looking for solitude or even wild animals to watch or photograph. 4. Take your trash with you when you leave. 5. 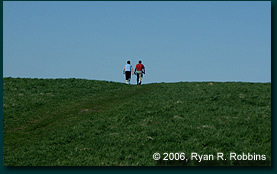 When hiking and approached by a bike, pull to the far right and, if walking with a partner, walk single file. The worst thing you and your companion can do is split up, forcing the bicyclist to ride between you. If you’re walking a dog, keep it close to you so it doesn’t jump in front of the bicyclist. Be aware of your surroundings and keep an ear out for approaching bikes. 7. Leave plants, logs, leaves, etc. behind so others can enjoy them. It doesn’t matter if you think the Queen Anne’s lace would look pretty in a vase on your dining room table. If everyone were to grab what they want, there would be little left for others to enjoy. 8. The city forester suggests that bicyclists travel East and West trails counterclockwise and Deer Trail from East to West. 9. In the winter, do not walk on the groomed ski trails (East, West, Deer, and Rabbit trails). Walking on the trails damages the ski tracks. If you must give your dog a walk, do it on the plowed access roads and have some courtesy for skiers. Damage to ski tracks becomes more pronounced when the snow melts and freezes again, making for an uncomfortable ski tour or worse, a fall and injury. 10. Fires are not permitted at all. 1. Stay on the boardwalk at all times. 2. Leave your bicycle, skateboard, snowshoes, or skis at the gate. 3. So others can enjoy the tranquility of the forest and the bog, refrain from using radios, shouting, or making other loud noises. 4. Pets are not allowed. 5. Be mindful of others’ quest for clean, fresh air: Do not smoke. 5. Take all trash with you. 6. Take only pictures; leave plants and flowers so others can enjoy them.